The all-electric E900 is the industry's most versatile, modular, precision miniature hotmelt applicator. The E900 series applicators install in tight spaces commonly found on parent machinery. The standard E900 design allows arrangement of up to eight individual valve modules on a manifold. Adhesive feeds to the manifold through one hose. Each valve module supplies adhesive to a single nozzle, ensuring sharp cutoff and multiple bead patterns, Various adhesive patterns are achieved on the same applicator by electrically programming the activity of up to four independent valve groups. Available in standard, top entry and low profiles, the E900 adapts to side, top or bottom-apply applications. Individual valve modules and blanking kits arrange on the manifold to yield specific adhesive pattern spacing. Valve modules are easily interchangeable for cleaning or replacement. The E900 accepts AC or DC signals to energize the coils on the valve modules. 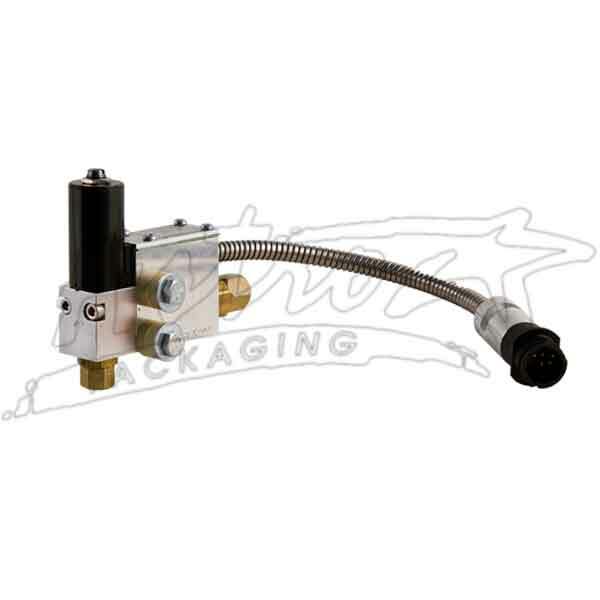 For high performance applications, ultra fast and accurate firing rates are obtained with Slautterback head drivers. The E900 operates at speeds and excess of 6,000 cycles per minute when aided by Slautterback head drivers using conventional packaging adhesives. Accurate temperature control to +1F (1 C) is achieved with RTD sensors and Slautterback microprocessor temperature controllers.